Check out the happenings at the lazy river from the porch. Warning!!! The view will take your breath away. Be quick to rent this nicely decorated piece of paradise. There is free wifi high speed internet access in the unit and many local attractions that are convenient and affordable. 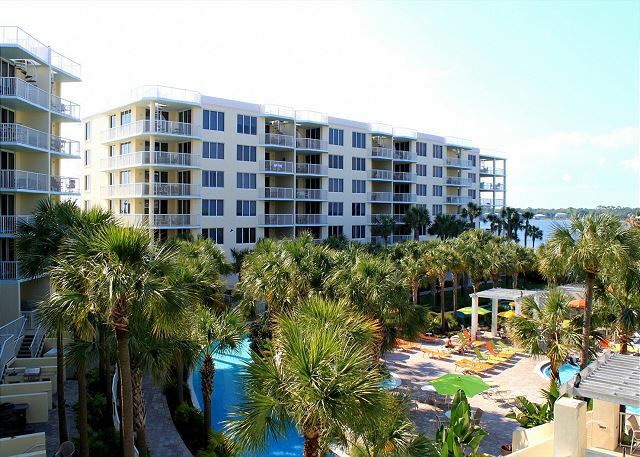 This professionally decorated condo is located in one of Okaloosa Island's premier properties, The Destin West Beach and Bay Resort. 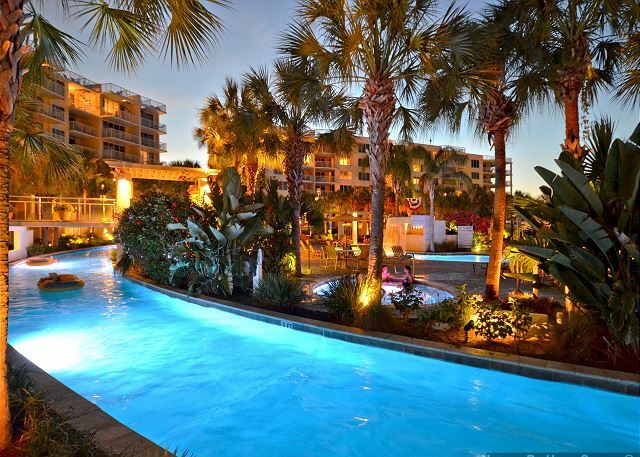 The amenities are awesome and there is something for everyone in this conveniently located resort. Take advantage of the 700 foot lazy lagoon river on the premises or the seasonally heated, large waterfall swimming pool. There are also two oversized spas on site and a bar area designed for informal gatherings. 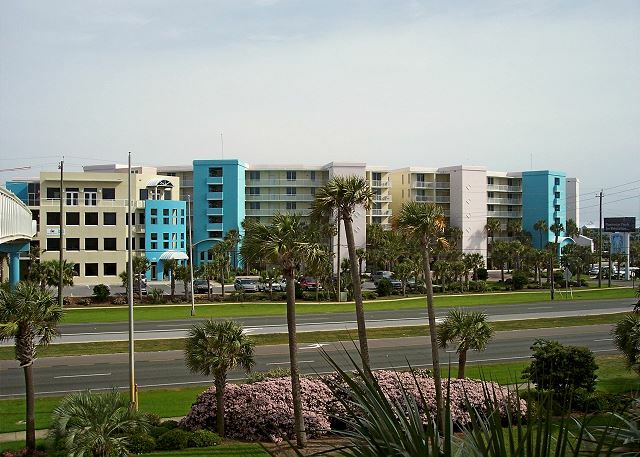 As a resort guest you also have access to all of the amenities of the Beach Resort directly across the road with additional pools and a state of the art fitness center. While you are there take advantage of the facilities including a Kiddie Water Spray Park. All are included with your stay free of charge! Undercover parking is also provided on premises. This is a very private, third floor one-bedroom condominium that is beautifully furnished and decorated in a sunny tropical theme. The condo sleeps seven people comfortably and has spectacular views of the bay and lazy river lagoon. The master bedroom has a luxurious king size bed, private full bathroom and television. It is furnished with lovely antique pieces which adds a romantic bed and breakfast feel. The bunk area is located in a separate hallway for privacy and a second bathroom is located adjacent to this area. The bottom bunk makes into a double bed when extended out and the top bunk is a single twin. For additional overnight guests, there is a pull-out queen size sofa sleeper. A fully equipped kitchen with a dishwasher, ice maker, blender, toaster, and more. Enjoy fixing a seafood feast while you check out the bay views. There is informal seating at a breakfast bar or kitchen table. A washer and dryer is located in the condominium for your convenience. The living room includes a convertible sofa sleeper, oversized stuffed chairs, a large TV with DVD as well as a CD player. The balcony has comfortable high-rise seating to take full advantage of the views. Come enjoy this little piece of paradise that will have you returning year after year. IF YOU HAVE FAMILY OR FRIENDS YOU WANT CLOSE BY, we also manage VRBO# 1054903. It is on the same floor as this unit. The condo was spacious enough for my husband and I and our five boys. The rental company was very gracious to meet our needs and in our evacuation during Hurricane Michael we were able to return and stay an extra night. This is close enough to the lazy river to almost reach out and touch it. Would definitely return. Beach is beautiful! Dear Ms. Knott, We're so glad you were able to return to enjoy the rest of your stay in 307 Sandpiper after the storm had passed! Thank you for sharing your wonderful experience! We'll be looking forward to helping you book your next vacation! The only problem was we didn’t stay longer!!! 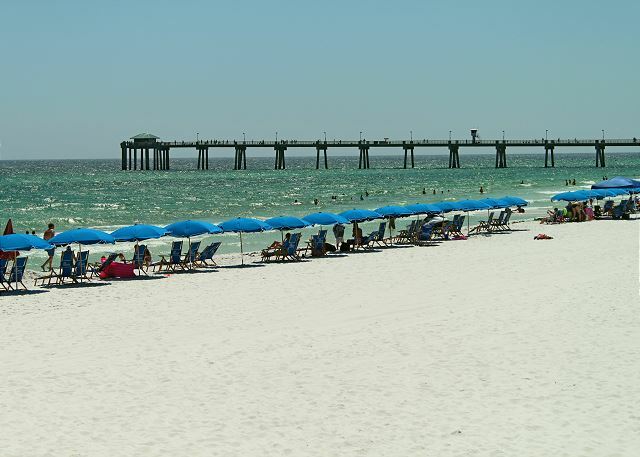 Dear Ms. McLean, We'll just have to remedy this problem as soon as possible with another vacation at Destin West Condos! We'll look forward to having you back! We were on the 3rd floor right next to the lazy river and bay. We snorkeled in the ocean and in the bay. There are lots of things to see! It was a great location and the condo was really nice. The only complaint we had were the beds were all really uncomfortable. We would definitely stay at this property again. Dear Ms. Lawson, Thank you for taking the time to leave us a review! We truly appreciate your feedback and will be standing by to book your next trip whenever you're ready to come back! 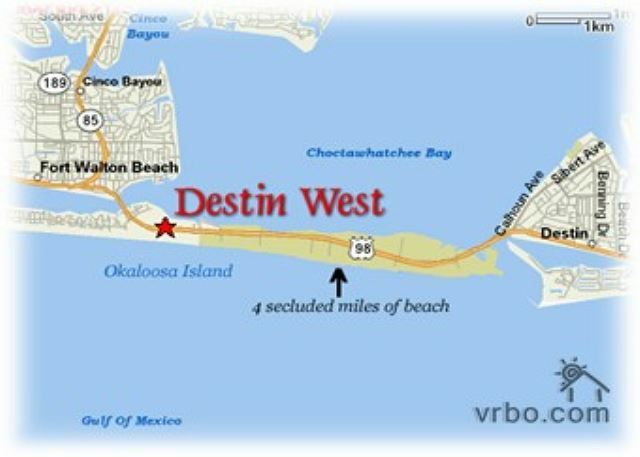 Destin West is a great place to stay. Dear Mr. Folse, I agree whole heartedly! Thank you for the great review! Our stay at Destin West was a very good was the first time we have ever stayed on the Bayside, and we would Definetely do it again. The resort was beautiful! The staff was courteous and easy to work with. Very good vacation! Dear Ms. Dixon, Thank you so much for this wonderful review! We truly appreciate the feedback. We will look forward to your next visit! Please come again soon! Everything was just as described. Very clean. Felt at home. Plenty of room for family of 7. Friendly and easy booking. Very comfortable bedding. Dear Ms. Carmack, Thank you for taking the time to leave us such a wonderful review! We truly appreciate the positive feedback and will be looking forward to your next visit! Thank you so much for letting us know you enjoyed your stay! Great condo. Everything you need inside of it, beautiful location and convenient. Absolutely recommend. Dear Ms. Biles, Thank you for your stellar review of this beautiful unit. We look forward to your next visit! My husband, I and my 2 years old spent great vacations in this apartment. It is very close to the lazy river, and the beach is only a 5 minute walk without crossing any road. The only complaint I have is that it was missing some amenities: furniture for clothing, scissors, cereal bowls, trash in bathroom, wooden spoon for cooking. Charlotte, thank you for the great review and for bringing to our attention the needed items. We furnish those items but sometimes they have a way of getting lost. We have taken care of adding back to the condo. If you had let us know we would have gladly brought them to you while you were there. We booked this condo after Labor Day. The property manager was very quick to respond. 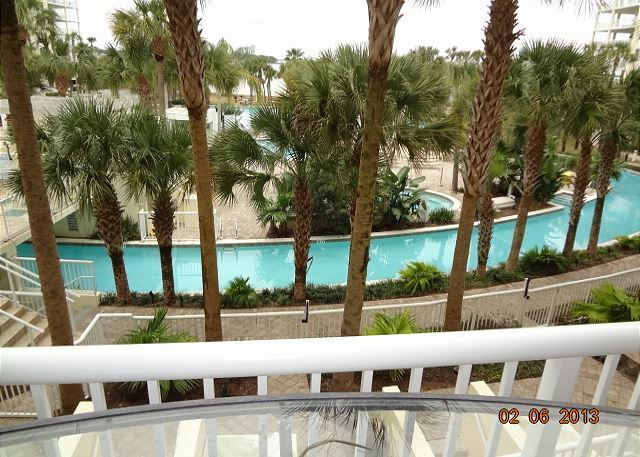 We stayed on the bay side, since we have a toddler & there was easy access to the lazy river & zero entry pool. My family visited the beach, Oceanside pool & splash pad during our stay. It is a long walk, but it was very nice to have the crosswalk & all of the amenities. The actual condo was showing some age in the shower & the paint. The ice in the freezer had a sulfer taste, but there is a gas station next door where you can purchase ice. I would definitely stay here again. The little things were not that big of a deal. We made breakfast most mornings & there were plenty of utensils. I have a bad back, so I was worried about the bed, but it was so comfy! The garage offered so much for us to use. It was very organized & easy to find anything. Since it was the off season, there was no trouble finding a parking place under the condos & they were big enough for our suv. I'll make it short, everything was perfect. Great place to visit. Awesome view of the lazy river and pool. We had a great time and definitely plan on returning next year. This was a great place that had the best of both worlds (beach and pool). The lazy river was incredible and they even had a splash pad for our little one. The full kitchen allowed us to cook breakfast in he mornings and eat snacks throughout the day. Our unit was missing a blender and the property management brought us one within the hour of notifying them. We couldn't have been happier and look to return in the future. We were staying there for my grandsons baseball tournament. This condo was perfect for location to the baseball fields where we played and convenient to restaurants as well. 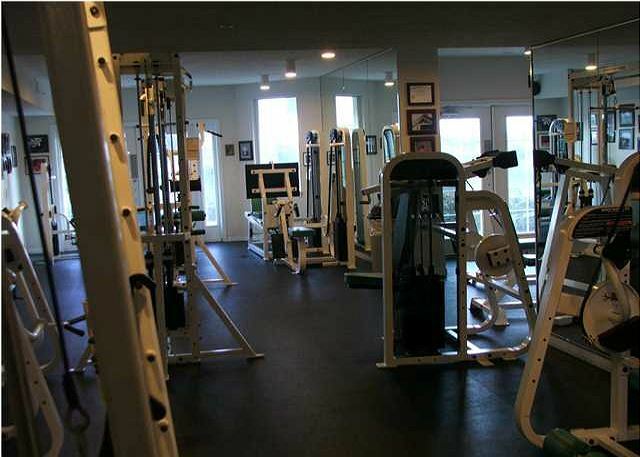 The property had many nice amenities and was well maintained. I stayed over spring break with my two daughters 8 & 14. The unit was right near the pool area with a great view. 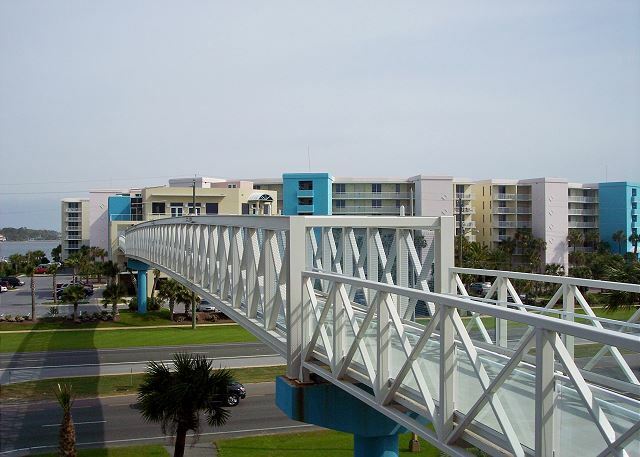 We went to the beach and it was really awesome to load up the provided beach gear and head across the skywalk. Our week long stay was great. 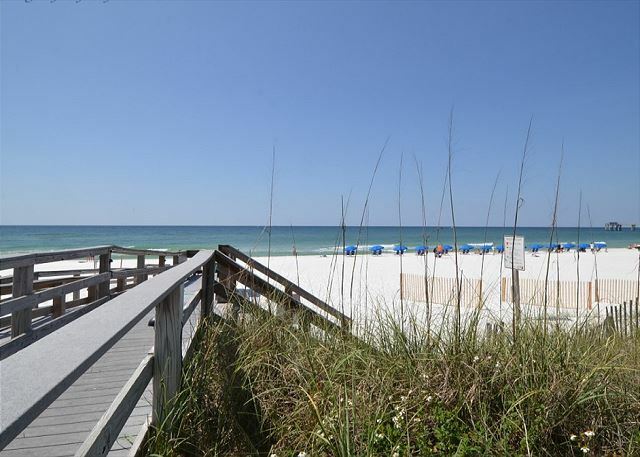 The property is conveniently located near Ft Walton so shopping was only a minute away.